Long ago in a galaxy far, far away, I gave up my indignation over George Lucas screwing up Star Wars and sequels/prequels by re-editing scenes, adding special effects and rewriting small but central parts of the original experience. 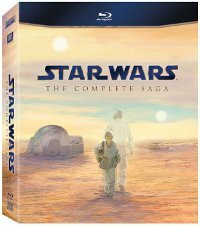 That doesn’t mean I like it—I’ve kept my lo-fi, non-anamorphic DVD edition of the original Star Wars, just so I can preserve a copy of the experience I first had way back in 1977 without the CGI noodling in the margins of the Mos Eisley spaceport and other scenes—just that I’m tired of complaining about it. So in Star Wars: The Complete Saga (Fox), I can confirm that Greedo doesn’t noticeably shoot first (it’s pretty much simultaneous by now) and Muppet Yoda has NOT been replaced by a CGI version, that all those distracting CGI embellishments to the original Star Wars (aka A New Hope) are still there and still distracting, that Vader doesn’t scream “Noooooooooooooooo!” so much as growl “Nooo!” at the end of Return of the Jedi, and that I still don’t care about Episodes I-III. With that out of the way, we get to the question that the collectors have: is it worth the upgrade? And the answer is pretty simple: if you want the highest quality of presentation for a high-definition system, then yeah, this is a definite step up in video clarity and audio muscle. It’s possible that it could be better, as Lucas is using digital source material created for its DVD debut, but it looks good to me. If you are more concerned with the integrity of the original films, however, you might as well hang on to those unrestored editions on DVD. Those are hardly state of the art (Lucas made sure of that back in 2006 by presenting them in non-anamorphic editions—an unnecessary slight to his loyal fan base) but they are the original theatrical versions, which Lucas is apparently uninterested in making available on Blu-ray.